In today’s Campaign Diary, the hotels lobby and Labor work their anti-Xenophon messages to the top of Google, the young Liberals are still excited about Barnaby (even if no-one else is), and Ian Hunter gets his time to shine. Nick Xenophon is facing multi-faceted campaigns against his bid to hold the balance of power. 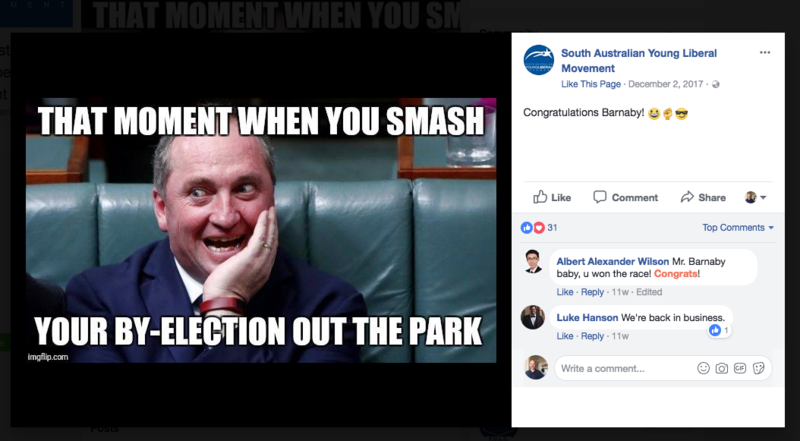 The South Australian Young Liberal Movement might want to update their Facebook page, given the events that have been gripping Canberra over the past few weeks and again today. The image at the very top of the pile is somewhat startling. Pugnacious Environment Minister Ian Hunter led the charge for Labor today, announcing a plan to waive registration and stamp duty for electric cars. The policy is the latest in a series of announcements about renewable energy made this week (Labor likes a themed approach). Unlike the other press conferences this week, Premier Jay Weatherill wasn’t to be seen. Now just to find those other Labor ministers who have been nowhere to be seen so far in the campaign – there are many. The Liberal Party’s policy to strip prisoners of the right to vote in the South Australian elections violates international human rights obligations, the SA Council for Civil Liberties says. If it wins the next election, the Liberal Party will disenfranchise prisoners sentenced to three years incarceration or more, for the length of their sentence. The party’s policy document on the subject states: “people who have shown no respect for the law … should lose the right to have a say in how they are governed”. SA Council for Civil Liberties chairperson Claire O’Connor said this would violate the Universal Declaration of Human Rights. As a signatory to the convention, Australia had an obligation to uphold it, O’Connor said. “Australia is a signatory to this convention and taking away this right on the basis of it being done this way in some other jurisdictions is a cavalier approach,” she said. “In chasing votes it seems the Liberal Party has forgotten what it stands for. She said because Australia was the only Western developed nation on earth without a bill or rights – and because the country has ratified the Universal Declaration but not made its provisions binding under Australian law – the country violated the UN convention on a “daily basis”. Connor told InDaily the policy would effect disproportionately affect Aboriginal and poor South Australians. In the US, stripping voting rights from people convicted of felony offences has been criticised for disproportionately disenfranchising African-Americans. According to an analysis by research and advocacy group the Sentencing Project, one in 13 African-Americans of voting age is stripped of voting rights by felony disenfranchisement. The rate is more than four times higher among African-Americans compared to non-African Americans. Overall, according to the group, more than six million voters were locked out of voting because of criminal convictions in 2016. If a curious punter wants to find out about Nick Xenophon’s policies, they’re probably going to type the SA Best leader’s name into Google. But what is likely to come up at the top of the search page is a link to two anti-Xenophon websites – one run by his sworn enemies at the Australian Hotels Association with the pithy name “nowaynick.com.au” and another, more mysteriously named, “Politics Now” website. “No Way Nick” is devoted to pulling apart Xenophon’s anti-pokies policy (including declaring that his use of the term pokie “baron” is “a cynical political strategy to deliberately demonise a sector of the business community for political gain”). “Politics Now”, if you examine the fine print, is the work of the South Australian branch of the Labor Party. It says Xenophon “talks independent, votes Liberal” and makes the claim that he “is likely to vote with Steven Marshall to cut and privatise hospitals and schools”. Which is bold when you consider that Labor has literally sold a public hospital site – the Repat – to a private organisation. At the top of the page there are links to other “candidates”, including Steven Marshall, about whom the website says “don’t risk South Australia’s future” on him (and still includes the old Wok in a Box smear from last time around). If you haven’t caught up with it, InDaily is doing a weekly election podcast: The Unwinnable Election. Hosted by experienced broadcaster Nicole Haack, it includes the insights of this correspondent and InDaily senior writer Tom Richardson. Xenophon’s brilliantly horrible commercial has not only saved him spending any money on getting it broadcast – the studied cringworthiness of it has done the work for him – but it’s also spawned this lovely parody from the SBS comedy team. Additional reporting by Bension Siebert.